While I’m not sure others did, I totally got the joke. As the party panders to elitists, there are many clues dropped into the paper that can be hard to spot for your average Joe Blow journalist. Most Ontarians may think that Hudak’s proposal should be taken seriously. Luckily, I’m no Joe Blow. I spent a solid six minutes identifying these clues so that you don’t have to sound like an idiot the next time you mention this plan to your local PC MPP at the Victoria Day Long-Weekend Fair. (In Georgetown, that event was called the Bang-o-rama. No one wants to look like a moron in front of Ted Chudleigh at the Bang-o-rama). The paper, called Paths to Prosperity offers eleven paths that would drastically change how university and college education is delivered. Clue number 1 that this is a joke? One cannot take eleven paths at the same time. Obviously penned by a staff writer at The Onion, Paths to Prosperity contains 10 other references that indicate that none of the document should be taken seriously. For example, it hilariously refers to private careers colleges as, “one of our most efficient paths to employment” (clue number 2: no they aren’t, though they are a path to lots of student debt). The 24-page document starts off with a letter from Hudak that says, “[PSE] gives us all a chance to reach higher….” This is clue number 3: Reaching Higher has been the name given to the Liberal’s higher education policies since 2006. Had this not been written in jest, surely the pale and awkward fellow writing on Hudak’s behalf at PC HQ would have been caned by now. Clue number 4 is that the Globe and Mail quoted the CEO of Colleges Ontario as having “lauded” the recommendation. Despite all other sectoral stakeholders agreeing that allowing colleges to slap the label “degree” on their diplomas is a stupid idea, CO’s unfettered support for anything that leads them closer to the rank of “real” administrator (like the president of Algoma University), is a clue that this document cannot be serious. The PCs also include a graph that they cite from the Drummond Report, which Drummond cites as being from the Ontario Undergrad Student Alliance (OUSA). It represents the percentage change of several university costs over five years, in a pie graph. This is clue 5. Remember when you were young and you learned about graphs and you wanted to make everything into a pie graph even if there was no 100% total for the pie to be whole? Well, OUSA got all Grade 3 on us and made a graph that expresses several years of inflationary changes as 100% of something, then divides the pie to demonstrate that (shockingly!) professors’ salaries have been the largest point of growth. Maybe its because there has been more professors hired to handle the tens of thousands of new students in the system. Maybe its because professors get wages that have been agreed to by administrators through collective bargaining. Either way, a pie isn’t the way for an adult to represent this data. The authors must have snuck it in because it would be hilarious. Which it is. Clue 6 is that they entirely neglected to talk about research, the core of the academic mission of all universities and, increasingly, colleges. That would be like presenting six streams to improve dairy farming in Ontario and forgetting to mention cattle feed or pasteurization. Or like analyzing this paper and pretending that it’s real. Crazier than that, clue 7, is that they actually argue that many universities should stop doing research. You know, become more like colleges. Which makes sense in the context of clue 8, the promise to allow high school students to earn college credits from their high school credits. 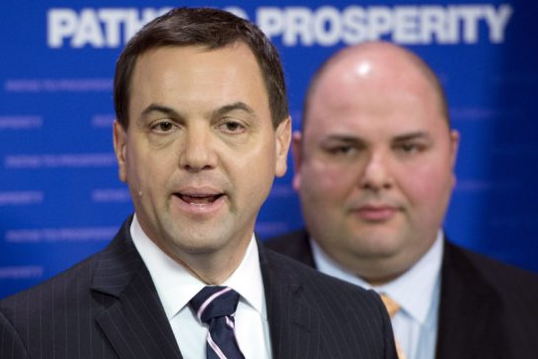 With high school the new college and college the new university, we’re left to assume that in Hudak’s world, marriage is the new dating and retirement home flings are the new marriage. And then we die at 130 years old. You probably didn’t read that far into the document, as it’s really hard to get through, but by this point, the joke is obvious. For the few who are still reading, and who may still take this piece of satire for reality, the PCs envelop our critical faculties in the end with a black hole devoid of intellectual matter. Their big idea is to tie student loans to the academic success of students. So, if you get As, you get more loans. If you fail, you’re out of loans. This would create a world-class system where the dumbest rich kids and the smartest poor kids could hopefully study together, breed together and cancel out the politically worst elements of society for the Progressive Conservative Party. Actually, while this is clue 9, it’s the only point that actually makes sense. A possible Freudian slip from the PC satirist author. The penultimate clue, 10, is that they argue for elite education to cost more and regulated by out-of-touch, non-elected, unaccountable university Boards of Governors rather than government. This will mean a whole lot more rich kids will become lawyers, regardless of their thinking capacities, and a whole lot more poor kids will go to college, study online or not go to school at all. If you were looking for the ultimate social experiment when income segmentation is intensified, the PCs got you. Unlike Shakespeare, who littered his plays comic relief to save us from the depressing worlds of Macbeth and King Lear, the PCs have pulled a full-on SNL with Pathways to Prosperity, even down to the fact that the document runs a little long and the joke becomes tired before the end of the sketch. Unfortunately, there will be people who don’t think this is farce. There will be people who claim to believe that these proposals would improve higher education, like Linda Franklin at Colleges Ontario, whose job is to parrot the megalomaniacal intentions of the Senecas of the world to become the Yorks of the world, at all costs to the quality they deliver. If these recommendations were serious, they would not only not improve any aspect of the higher education system. Like Glen Murray’s hair-brained scheme “three cubed,” this White Paper would effectively block middle-income youth from universities, low-income youth from anything and give rich kids more of a free pass than they currently have. But, it has to be satire. No one in their right mind would call a policy paper with implications such as these, a “White” paper in a non-ironic way (clue 11). For months, Minister of Training, Colleges and Universities, Glen Murray, has been promising a revolutionary, new, innovative, amazing, spectacular, life-altering, history-creating, groundbreaking *policy* change that would bring higher education into some fictional reality most of us aren’t privy to. Well, its discussion paper (whatever that means) has been released. It’s here. It’s SO revolutionary that you’ve probably never heard of it before. It’s the hipster version of policy delivery. *Spoiler alert* it’s written as if the conclusions are foregone. I could waste a lot of time telling you why I think this entire thing is a charade, but I respect (most of) you too much to waste your time. So, I’ll stick to the most obvious signal, for me, that this will be an exercise in the generation of vacant buzz words rather than progressive, positive policy development. At the FIRST mention of universities, the discussion paper (whatever that means) refers to universities as “publicly assisted” rather than public. This year, nearly all Ontario universities will collect more revenue from private sources than from public sources to fund operations. This effectively means that they’ve been privatized by stealth. It’s worth noting that, before Glen blocked me and others on Twitter, he called us liars when we pointed this out. Look it up yourself. Make sure it’s comparing operating grants to tuition fees, otherwise, it’s lumping in a bunch of other funding envelopes that will skew this number. But, anyway, we’re past the era of public universities and the government is obviously aware of this. So, what’s wrong with such a line in such a discussion paper (whatever that means)? It’s a foregone conclusion. It readily admits that the government is uninterested in increasing its funding to universities. And, if they don’t, students do. Saying that the system isn’t sustainable and there’s a problem, but then admitting in your own definitions that you’re uninterested in any solution that includes increased government funding is simple cognitive dissonance. Underfunding *is* the problem. How can you have an open consultation process when you’ve already settled on the idea that government is not going to pony up the dough? I’m living in Québec now, I should stop caring about Ontario. But, it’s really hard. The Liberals there are a making worse decisions about higher education than Mike Harris. Re-read that 10 times aloud, please. It can’t be said enough. Dalton hasn’t once reversed any of the garbage tuition fee decisions that were made by Mike Harris. In fact, he layered a 71% fee increase on top of Harris’ fees. This “crisis” that Glen is hoping to solve through twitter conversations (seriously, he’s asked for twitter comments on this, unless he’s blocked you, like all vocal student critics in Toronto at least once have been), was created by him, previous Ministers and his government. Actually, Nick Falvo talks about this in the broader Canadian sense, here. Sorry if I’m pessimistic about this exercise, but it just doesn’t feel right. It’s like bringing the thief who broke into your house and stole your Gibson back as a consultant to give advice on thief-proofing your guitars. Or, we should at least insist on consistency: publicly assisted hospitals. Publicly assisted dairy farmers. Publicly assisted Rogers Inc. Publicly assisted Inco. Publicly assisted Caterpillar….sorry, scratch that one.